On this special occasion, Grand Mercure Danang has offered a gastronomic promotion for couple who dines at the hotel during this time. 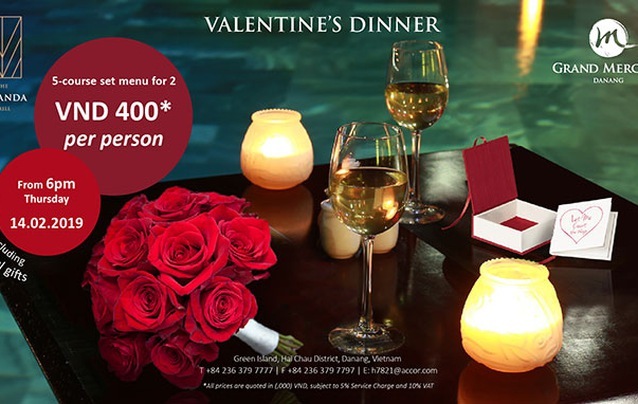 The romantic Valentine’s day set menu will features five courses that special prepared for couples only, at price starts from VND800,000 per couple, serving from 8pm till late at night. There is also another choice for couple on their days- The ‘romantic Valentine’s package’, at price starts VND2.885.000 per couple, including a night stay at the Deluxe room with buffet breakfast, romantic decoration in the room, privileges from Privilege Lounge, Valentine’s feast in 14 February and 40% off on Spa treatments.